CollineIO board is a general purpose inputs/outputs control board. It is able to manage digital and analog inputs/outputs. It can works as a master or as a slave. Working as a master, users can develop their own software to read/write to any input/output. Cerro will supply a software example and the users using free IDE from Cypress PSOC Creator, will create their own application. User can connect a touch panel to govern the full system. Working as a slave, an external CPU, using industrial standard MODBUS RTU protocol will ask to the board the status of the inputs or set the outputs. The external CPU can use RS-485 or RS-232 to communicate with it. Another possibility is to plug a RaspberryPi (or other format size compatible) in the internal connector. CollineIO firmware will manage all the input/outputs according to the commands received from the external CPU. CollineIO is based on PSoC Programmable System-on-Chip, CY8C5868AXI-LP035, ARM Cortex- M3, 256 KB Flash, 62 GPIOs and analogue peripherals. A free test software helps to evaluate the board and the command protocol. Please download it from the documents tab. For Other quantities, please contact us. 8 General opto-isolated inputs, maximum 30V. On board led to indicate the state of each input. 2 Pulse inputs able to count pulse frequency inputs up to 5Khz. 4 Input channels, hardware configurable: 0-20mA, 4-20ma, 0-5V & 0-10V. Each channel can be configured as voltage/current input using an integrated microswitch. One additional channel for a high precision sensor in the ±1V range (for example, pH sensor). 6 channels based on power relay (10A), with NO and NC contacts available. Includes snubber filter and status LED for each output. 2 opto-isolated channels. Pull-up resistor connected to 24V, configurable using an integrated microswitch. Includes a status LED for each output. PSOC5 LP family of microprocessor by Cypress. Based on ARM Cortex-M3 core and a large variety of selectable digital and analog peripherals. 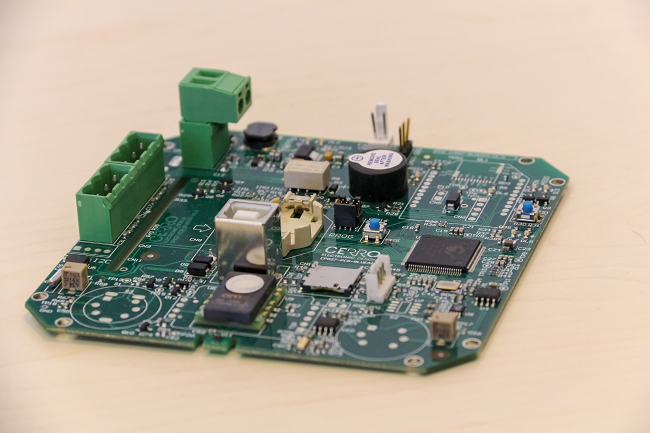 Alternatively, direct connection to RaspberryPi (student or amateur) or i.MX6UL Module from Digi for industrial environments. Expandable System. Bus Configuration ID. On board switches to configure up to 7 board IDs that can be connected in the same RS-485 Bus. R termination for BUS RS-485 available through microswitch. 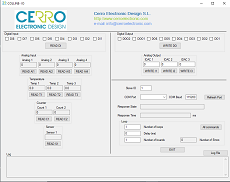 Please send us an email to info@cerroelectronic.com and we will send you a link for download it. It weights 60MB aprox. Full System to measure the IAQ (Indoor Air Quality). Includes different sensors and data recording in the cloud for analysis on large periods of time. Ideal for hospitals, health centres, laboratories, offices, schools, universities, hotels, homes, industries, workshops. 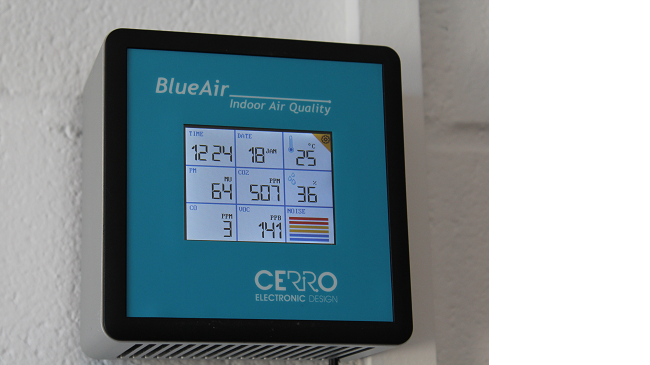 BlueAir is a device that measure the quality of indoor air in real time. The air we breathe indoors may not be ideal for our health or work performance and is of special interest to people with respiratory problems. It is estimated that people spend 90% of their entire lives indoors. Both the WHO (World Health Organization) and the EU (European Union) recommend the control of contaminants that can usually be found in indoor rooms: CO, CO2, fine particles (PM10 and PM2.5) and VOC (Volatile Organic Components) such as benzene, formaldehyde, naphthalene among others. In some European countries directives on air quality have already been published in public spaces such as schools and hospitals. The measurement of air quality is the first step to take actions such as increasing the ventilation of the place or filtering the air. PhotoArray is an array of photodiodes placed at a fixed pitch to measure the incident light on them. In addition to the array of photodiodes, it also contains the electronic necessary to measure the current through them and a microcontroller capable of digitizing such currents and transmit them, via serial communication, to an external processor. On board switches to configure up to 16 board IDs that can be connected in the same RS-485 Bus. With this model you can simulate the photodiode, output filter and so on. To get the file,please send us an email to support@cerroelectronic.com and we will forward to you.